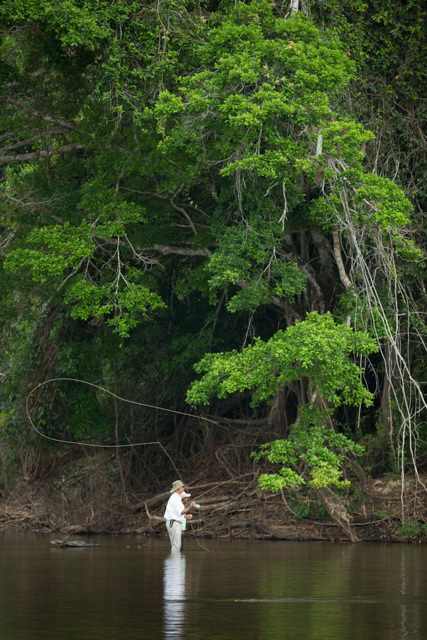 Meredith McCord and photographer, Matt Jones, of Tailwaters recently returned from jungle angling in Kendjam in the Amazon Basin of Brazil with Untamed Angling. 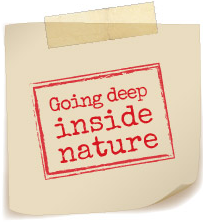 We will be featuring Meredith’s daily record of her angling ventures in a nine-part travel journal. This is part five. Last night was alive with the sound of crickets, frogs, howler monkeys, and Roberto snoring in the tent next to mine. But I woke up to the smell of egg and ham scramble being prepped by Rafael, and the hot water was boiling on the fire for the Nestle instant coffee. The morning was incredibly beautiful and slightly cooler than the past few, causing steam to rise off the river. We began to pack up camp because immediately after our three-hour morning fishing session, we had a long ride back upriver. Roberto, Matt and I piled in a boat with two Indians and Rafael. We had high anticipation for these lower waters, hoping and praying that our long trek down would pay off, as yesterday felt like a bit of a bust. Rafi tells us to rig up our wire and biggest poppers, as we were going wolf fish hunting. I rigged my Sage ONE 8wt with RIO Redfish 8wt line and RIO 40lb wire. A short leader is all that is necessary for these aggressive creatures. Rafi positioned us right next to a little inlet and instructed us to rip the first long cast up in the creek and strip hard and rapidly back to get the attention of the fish. The following casts were done slowly and deliberately to cause a huge disturbance with a four-to-five second pause after each pop. On my second cast and the second pop, a huge (almost 12 pound) wolf demolished my large chartreuse foam popper. 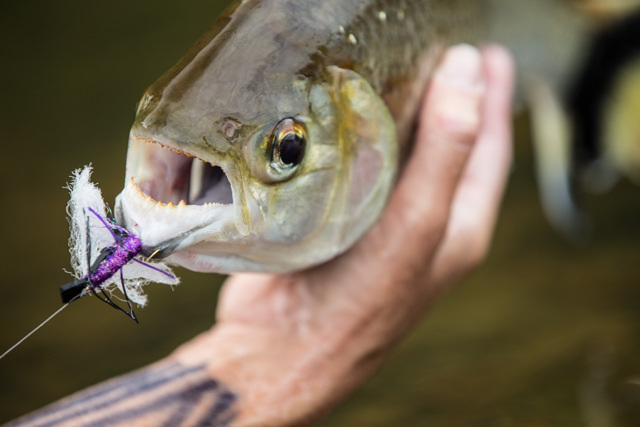 This isn’t the typical eat of a wolf on a poppers, and my next cast delivered a more typical experience: a slow follow from the fish who then then nosed it before a slow sip, like a trout on a dry fly. 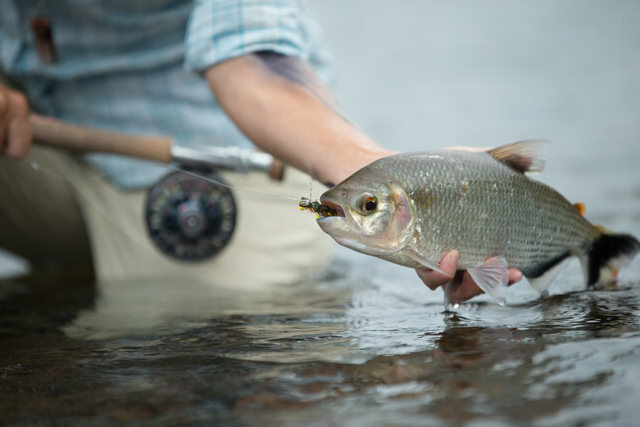 The wolf fish performs as expected with several series of head thrashing jumps out of the two-foot river flat. Now it is Roberto’s turn. His smaller crease fly didn’t get their attention, so he put on the same chartreuse foam head I used, and sure enough the next cast resulted in a pale olive green trahira (wolf fish). No sooner was he on that when two others came out to see about the commotion. I sent my popper over near his and bam! I was on too – a double. But Rafi, loving our enthusiasm knows we need all three. Why leave the third empty-mouthed? So he grabbed Roberto’s streamer rod with a large peacock colored Puglisi fibered 5″ fly and handed the rod to me. Sure to form, the last one ate and we landed all three. The morning shaped up nicely. Now the question is posed: Do we want to catch 20 more of these wolf fish in this creek, or do we want to mix it up by targeting some matrincha on dry flies? Always up for species and varieties and a bit of a challenge, we decide to pursue the latter. After a 10-minute ride north, we found slow moving rapids on an extensive river flat. Roberto took the left bank, and I took the right, armed with my Thomas and Thomas 6wt Solar and Abel 5N with RIO Redfish line and 9′ leader (4′ of 30lb, 4′ of 20lb and a foot of 12″ 30lb fluorocarbon for the bite). The river was almost too shallow, the fish were easily spooked, and the overcast day wasn’t making it easy to see these silver black-tailed fish very easily. 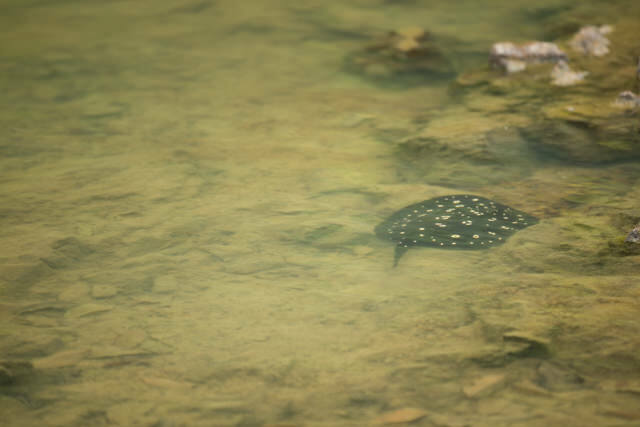 The flat was littered with 15″ diameter black with white spot string rays that were everyone’s biggest fear. Upon arriving to the lodge the first day, our sweet and beautiful hostess, Manuela, had been struck by one that very day and was still cringing in pain and hopping upon one leg six hours later. Her foot was swollen where the barb from the tail had struck her in the side of her foot near the arch. It was three days before she was able to put her full weight back on her injured foot. Within 10 minutes of wading, I hooked my first of these bullet-shaped fish on a yellow beat-up Pool Toy hopper. I hooked several before the hopper was so chewed up that it no longer floated. Out of yellow Pool Toys, I changed to a green and was rejected several times until I used my black sharpie again to color the underbelly. That worked immediately until a nice large five to six pounder chewed through the last few remaining inches of my 30lb tippet. l changed to large chubby black/purple Chernobyls as my 30lb was back at the boat. And I tied the fly directly to my 20lb class tippet, hopeful that the larger fly size would prevent the “saw toothed” fish from inhaling my fly too deep in their small mouth, therefore sawing through my tippet. A few more and we headed back to camp for a lunch of leftover steak, onions and spaghetti pasta with soy sauce along with freshly caught peacock, thanks to Ken and Brian and some delicious pork sausage. One thing is for sure: I got plenty to eat. 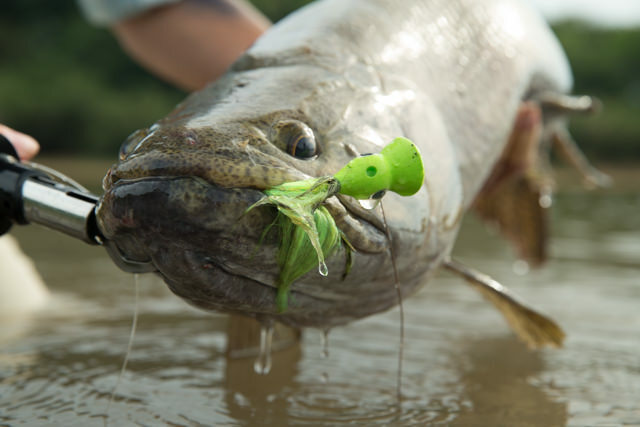 These guides aren’t just every day fishing guides, they’re chefs and mechanics. At 12:45 we packed up camp for the season, and we set off upstream to the lodge. No eventful ride upstream until an hour and twenty minutes out when our two blade propeller hit a rock morphing into a one blade propeller that would get us nowhere fast. Luckily Matt was behind us in the boat with the equipment and extra motor parts and quickly came to the rescue. 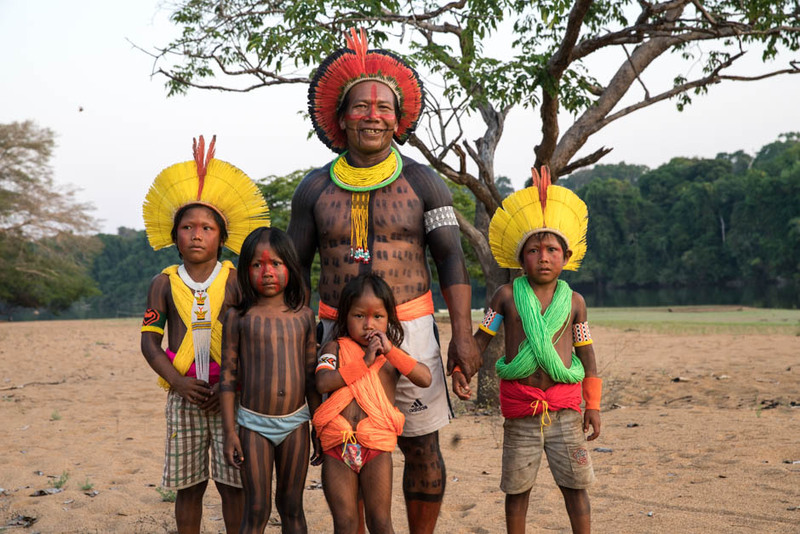 Upon arriving back at the lodge, the chief of the Kayapo’s village and his family were all freshly painted up and had on their brightly colored celebrations garb. He, his three children, and one of his wives all posed for pictures with us on the beach in front of the lodge. A very special treat. The chief, who wasn’t shy in asking us for “things”, asked Matt to give him his drone. Ha. I don’t think he was used to being told “no”, but hopefully, he took it in stride and understood Matt’s refusal.